Pay your Fonality monthly bill online. 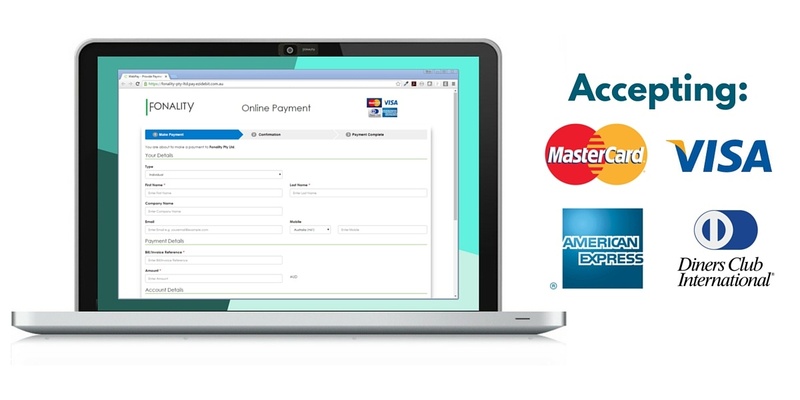 Online bill pay will give you the ability to securely make your payment at your convenience. Need to catch up on an overdue bill? Now you can, without contacting us. Waiting to update card information? Don't miss a payment while you wait. All you need is your contact information, invoice reference, and card details. Pay using MasterCard, Visa, American Express or Diners Club cards. Online bill pay isn't the only way to pay. We have several additional options for your preference. Set up your payments with a Direct Deposit Request and we'll take care of the rest. Enter your bank details or your credit card information and your payment will be made on a regular basis. Schedule your payments quickly and easily with BPay®. Just sign up via your online banking site or phone your bank. Manage when your payment with an electronic fund transfer. Call us at 1300 874 928 and use your Account Payment Reference when making a payment. We accept MasterCard, Visa, and AMEX. Please note a 4% surcharge (+GST) will be applied to AMEX payments.